In our previous discussions we came across 'How to integrate Hibernate with Struts' and 'How to integrate Hibernate with Spring '. In this particular blog we will discuss how to perform basic CRUD (create, retrieve, update and delete) operations in hibernate using annotations. We will create a simple Java project with maven and w'll import that in Eclipse. Than we will add required pom.xml file to make it Hibernate project. Our objective for today's discussion is to setup a Hibernate Maven project in eclipse and implement basic create, retrieve, update and delete operations with it. Before we start lets create a simple database and table to apply hibernate operations on. Copy and Paste the following sql query in your query editor and execute. Our very first step is to add all required hibernate dependencies to pom.xml, see the code below and add all required hibernate dependencies. 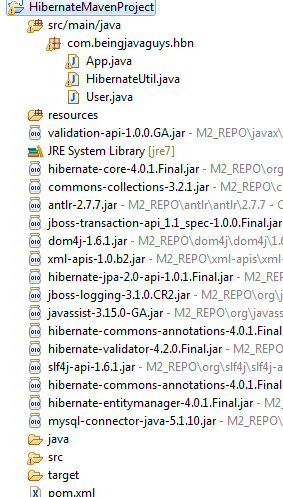 Now do a maven-install so that maven can download all specified hibernate dependencies for us. 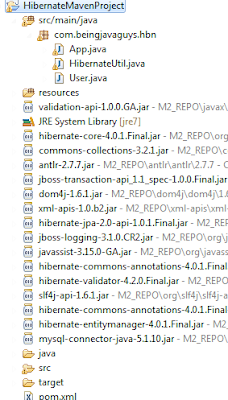 Pleas make sure your Eclipse IDE is able to identify all maven repositories, if not follow the given steps to add M2_REPO Manually. Follow the steps written below to make eclipse add all dependencies to project classpath. 1) Go to Eclipse menu bar and select 'Window > Preferences'. 2) Select Java > Build Path > Classpath Variables from left menu. If everything goes right you will see all your dependencies added to class path like this. This is a simple java class with a static method, we will use this class to get a session instance of hibernate session factory class. This is a simple pojo consisting of an user object, we will map this class to relational database using hibernate utilities. The code shown in below snippet specifies 'how to insert a row in database in hibernate'. The code shown in below snippet specifies 'how to read data from database in hibernate'. System.out.println("User First Name : "
System.out.println("User Last Name : "
The code shown in below snippet specifies 'how to update a row in database in hibernate'. The code shown in below snippet specifies 'how to delete a row in database in hibernate'. This is simple java class containing main method to start execution, see the implementation to identify hibernate working in create, retrieve, update and delete operations. In this particular blog we came across ?How to create a Hibernate Project in Maven?, 'Insert table in hibernate', 'Retrieve data from db in hibernate', 'Update a row in hibernate' and 'Delete data in hibernate'. In upcoming blogs we will see more about 'Maven', 'Hibernate', 'Java' and other Opensource Technologies.